The results of a research in Lac Bay into the influence of sea turtles on the seagrass areas. In Lac Bay there are many important habitats and the bay has a high biodiversity. Different types could be found there, among them also many internationally protected types like corals, sea turtles, conch, flamingo and the rainbow parrot fish. The diversity in habitats, reef, seagrass beds and mangroves each of them with their own functions, make Lac Bay a particularly rich area. STINAPA Bonaire has been already monitoring the seagrasses in Lac for some years, and discovered in 2010 a new type of an invasive seagrass, called Halophila stipulacea. 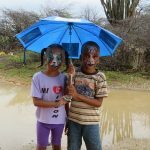 Sea Turtle Conservation Bonaire has been protecting and researching Bonaire’s sea turtles population since 1991, among others in Lac Bay. Because of its seagrass fields, Lac Bay is a very valuable feeding area and the sea turtles in this area are showing much higher growth figures than turtles in the rest of the Caribbean area. In 2010 a team of researchers from the Dutch universities of Wageningen and Groningen started with a research of the grazing of the seagrasses by sea turtles. Marjolijn Christianen, Lisa Becking and Per Palsbøll set up the research, which was financed by the NWO and the Ministry of Economic Affairs. 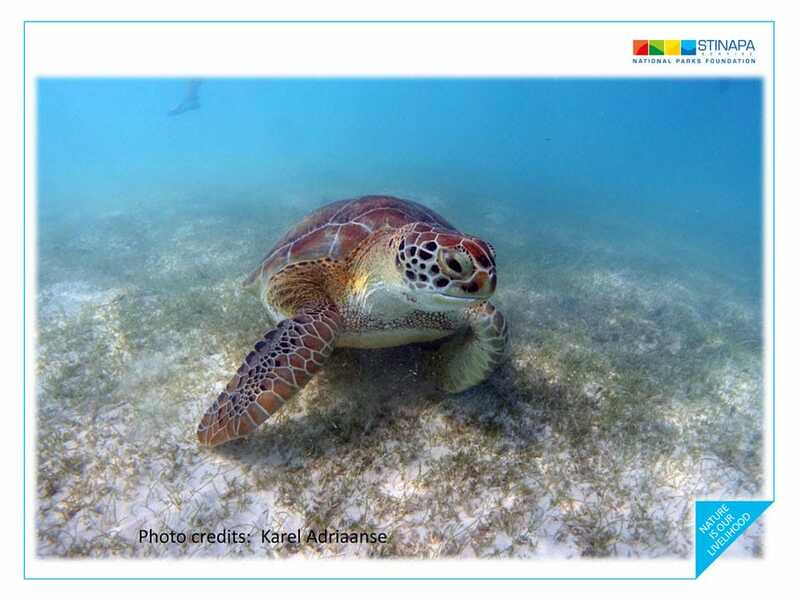 The team, which was further strengthened by colleagues from the University of Amsterdam, Sea Turtle Conservation Bonaire (STCB), STINAPA Bonaire and Wageningen Marine Research, wants to research how big grazers in aquatic systems are influencing the spreading of exotic plant types. The team performed field observations, experiments in underwater cages, and collected satellite images of the grazing areas of the last forty years, to compare the extend and the borders of the seagrass fields with the new situation. In addition, Marjolijn Christianen in cooperation with STCB has equipped green turtles with GPS transmitters, so the feeding habits of the turtles could be mapped. Is there nothing that can be done? According to the researchers it would matter if the sea areas would less be polluted by sewage water or dredging activities that are reducing the vitality of the old seagrass fields. We see that the sea turtles facilitate the expansion of the invasive seagrass from the Red Sea. To protect these charismatic grazers, it is important to reduce the stress factors on the entire ecosystem.